Bob Brown discusses historical foundations for creative place-making at the BottleHouse. On October 10, FutureHeights held a public forum at the BottleHouse Brewery and Meadery on elevating areas of our community through creative place-making. Attendees enjoyed hearing from several presenters, each with a unique view on what place-making is and how it can be incorporated into our neighborhoods. Bob Brown discussed historical foundations of place-making and how it has been used in other parts of Northeast Ohio. Ali Latusky-Love talked about thinking small scale for projects, such as putting art galleries in phone boxes and yoga moves and stretching ideas at bus stops. Nelson Beckford brought forth the importance of community social interaction and how residents can share the power of place-making to create healthy and exciting neighborhoods. The speakers presented lots of new and helpful information. During the forum, attendees sat at tables around the BottleHouse and discussed their thoughts and ideas. FutureHeights would like to extend that discussion to the Web. As intern for FutureHeights, I’ve created this blog to help residents of our community share their ideas for creative place-making in specific Heights neighborhoods. We want to hear your ideas for making the Heights a more exciting place to live and visit. -A picture of the location, or a concept drawing of your ideas. 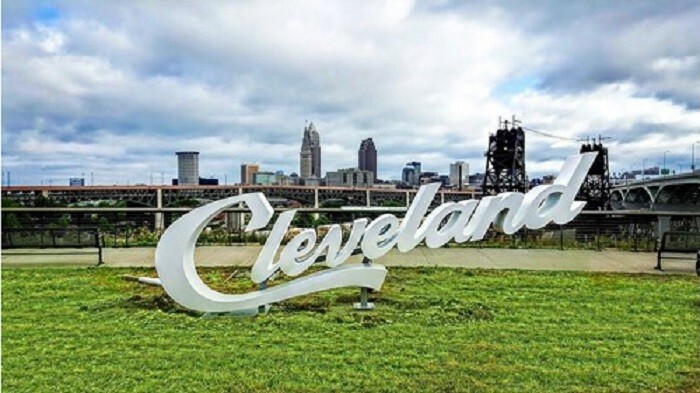 The script Cleveland signs that the city has in several places have made for great photo opportunities and have really instilled a sense of pride in the city. I wonder if we could do something similar at key neighborhoods in the Heights? I could see a sign like this in the Noble-Mayfield-Warrensville Triangle district that says Noble Neighborhood. I could see one in Coventry Village at the P.E.A.C.E. Park. Several other locations come to mind.